Monarch Air Group offers a wide variety of private jet charter options to and from Cyprus. Our clients benefit from top-notch service, unrelenting dedication to safety, wide selection of aircraft, and years of experience in chartering private jets. To obtain a free quote, please use our online quoting tool provided below, or call toll free 1-877-281-3051. Cyprus is the third largest and most populous island country in the Eastern Mediterranean Sea, off the coasts of Turkey and Syria. With its high Human Development Index and a prosperous economy, this island country is a member of the Commonwealth and is a main tourist destination in the Mediterranean, attracting over 2 million people from all parts of the world, albeit up to 50% of travelers come from Great Britain. 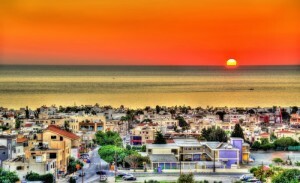 Cyprus is known for its rich history, art, prominent landmarks, awesome cuisine, and cultural diversity. The Limassol Carnival Festival is the most popular event in Cyprus. Cyprus is home to two international airports and several heliports. The country is served by Paphos International Airport (PFO) and Larnaca International Airport (LCA), as well as by Ercan International Airport (ECN) that offers flights only to Turkey. Our operators are standing by 24/7 to assist you in scheduling your next luxury air charter to Cyprus. Call us today for a free quote.